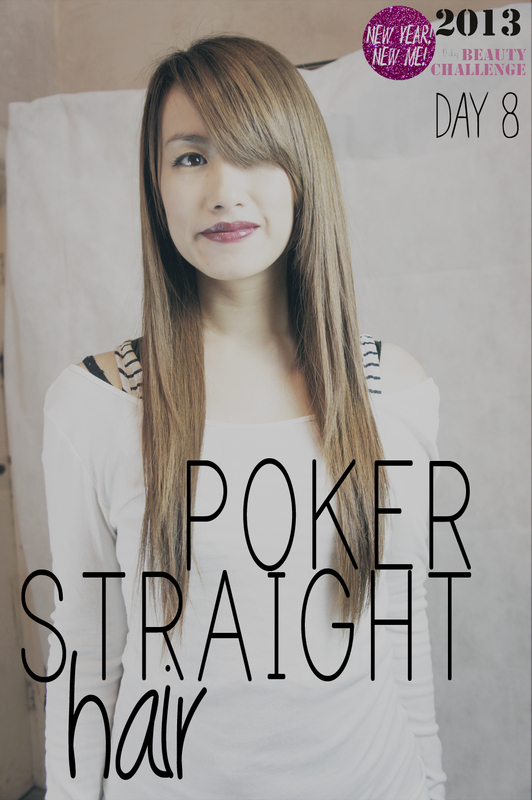 Poker straight hair seems to be making a come back from the 90’s! I still remember the first pair of Straighteners I ever owned – it was a chunky Babyliss one that took a decade to heat up! I would turn them on before getting into the shower so that they would be ready for me by the time I got out but even then it was still not quite hot enough! Thank god for the age of fast heat, ceramic straighteners hey! Ever since I managed to grow my hair to super, duper length (BUT still not quite long enough! I need 4 more inches until I’m happy) I’ve worn it slightly wavy as I like to have a bit of volume through my hair! However it looks like I may be dusting off the GHD’s starting from now! 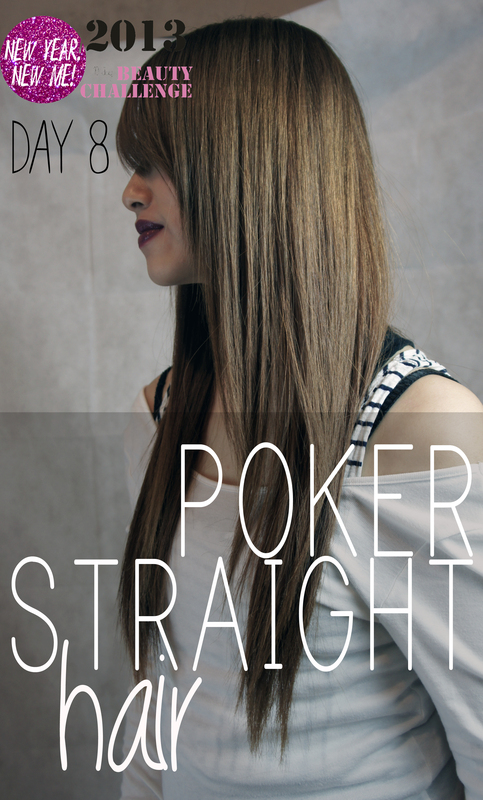 Today’s POKER STRAIGHT Hair Challenge and has reminded me just how much I miss the swish/swash movement that you could only get with dead straight hair! Not to mention it makes my hair looks so much smoother and longer! So my Hair straightener of choice is GHD’s! 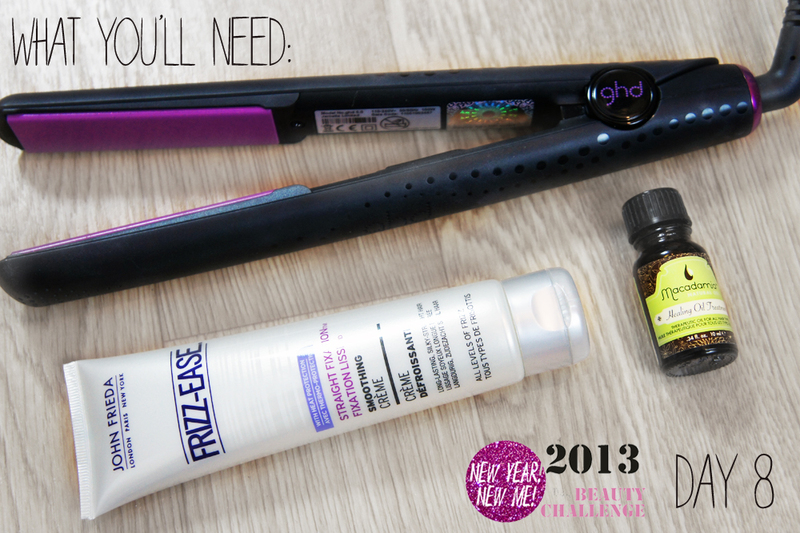 I’ve experimented with many other brands but I always go back to my trusty GHD’s! No other brand seemed to cut it for me! But I’m open to being proved wrong so if you have a much better recommendation I’d be happy to hear it! But you should know that I absolutely LOVE this limited edition pair I got last year! It has purple plates and pretty lilac LED lights! My Favourite Colour! To protect my hair before I subject it to a lot of heat trauma I used Frizz Ease Straight Fixation® Smoothing Crème before I blow dried it. Like all John Frieda products this cream smells utterly divine and the scent will linger on your hair until your next wash too! I find this product helps make my hair a lot more manageable. It detangles my long, long hair and even if I don’t plan to straighten my hair that day I like to use it like a leave in conditioner as it can still protect my hair from other heated hair appliances like dryer or tongs. Once I’ve ran my straighteners through my hair, I applied some healing oil treatment to tame any fly-aways and to give it a glossy finish! GHD HAIR STRAIGHTENERS: GHD|| STRAIGHT FIXATION SOOTHING CREME: JOHN FRIEDA|| HEALING OIL TREATMENT: MACADAMIA. Thanks for reading guys! Please come back Tomorrow for my next Beauty Challenge and if you have time you can check out all my other challenges here! 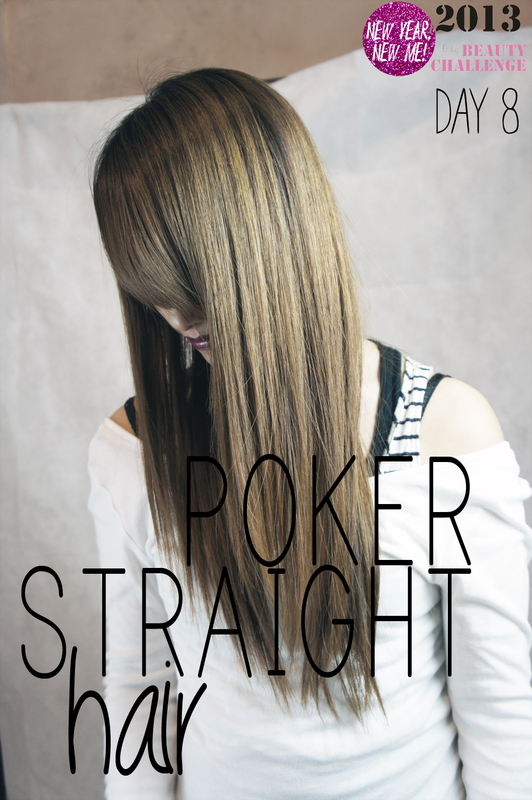 Tags: GHD's, Hair care, Hair Straighteners, Hair Trends 2012/13, John Frieda, long hair, Macadamia Healing Hair Oil, Poker Straight Hair. Bookmark the permalink. Haha I had a Babyliss clunker as well! Your hair looks lovely like this – in such good condtion! Your hair looks fabulous straight hon. I always wear mine straight as I find the straightener faster than curling. I have never had GHD’s but everyone raves about them so maybe they will be on my birthday wish list.